Bad news, Elon: There's a chance your Tesla Roadster may come crashing down to Earth, although not for quite some time. On Feb. 6, Elon Musk, CEO and founder of SpaceX and co-founder of electric car company Tesla, launched his Tesla Roadster into space atop his new Falcon Heavy rocket. The launch was just a test, so Musk decided to have some fun with it, launching the Roadster with a mannequin named Starman behind the wheel. Originally, the car was to drift in an Earth-Mars orbit. Instead, SpaceX expended all the fuel of the second stage rocket, which placed the car in an orbit farther out, toward the asteroid belt between Mars and Jupiter. 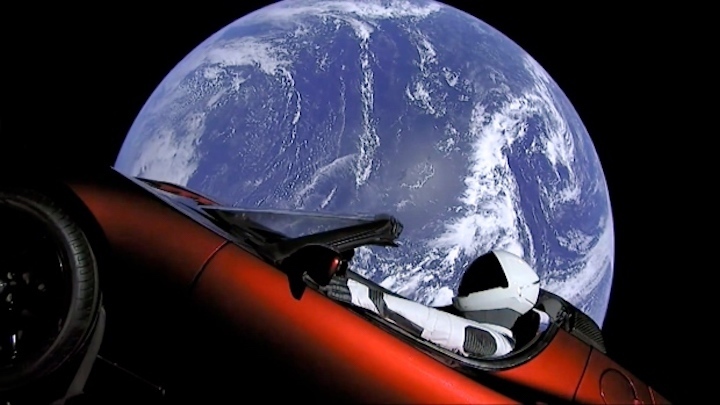 Before the launch, Musk said the Roadster could potentially orbit for billions of years, but a new study from the University of Toronto has calculated that it could crash into either Earth or Venus. 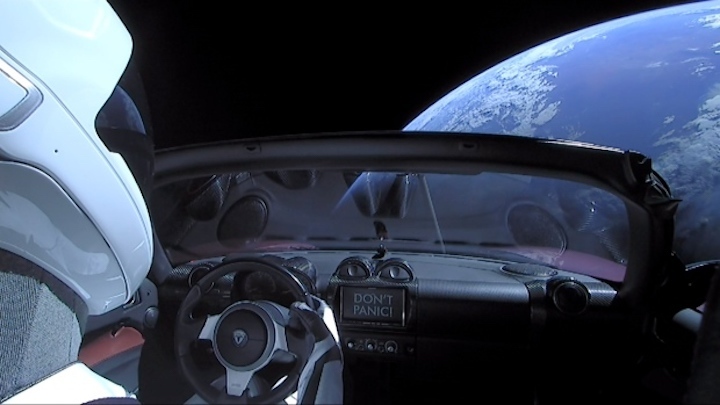 But, as a plaque inside the Roadster says: Don't panic. It turns out Starman's potential fiery end won't happen for millions of years. And even then, there is just a six per cent chance the Roadster will collide with Earth. There's a 2.5 per cent chance it will collide with Venus. Excited after the launch, Hanno Rein, director of the Centre for Planetary Science at the University of Toronto, said he and a team that includes astronomers from the Czech Republic decided to see if they could calculate the orbit of the Roadster. Their findings were published at arXiv.org and submitted to the U.K.'s Monthly Notices of the Royal Astronomical Society. "It was fun to do," Rein said of the calculations. "And there are many similarities to near-Earth asteroids, so it's not an entirely useless piece of work." 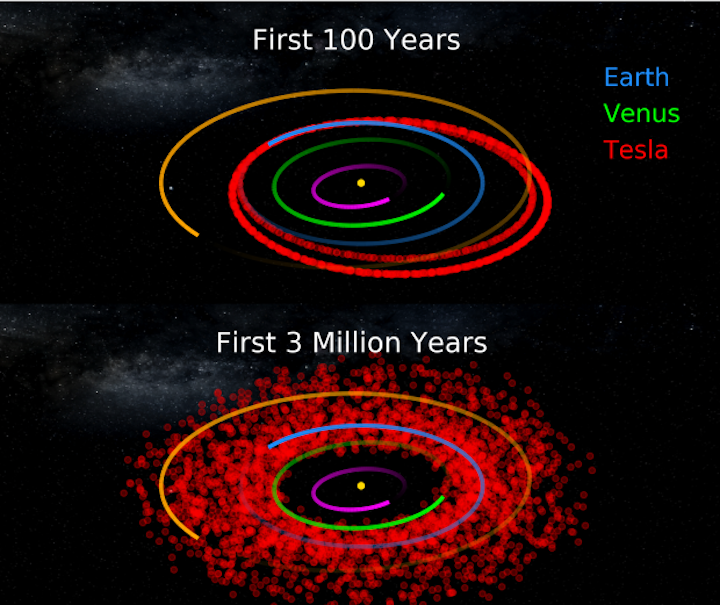 After an asteroid is discovered, astronomers work backward to calculate its origin and then calculate its future orbits. In the case of near-Earth objects, calculations can determine their likely course for the next 100 years or so to ensure there won't be a collision with Earth. But Rein and his team can't say for certain whether the Roadster will collide with Earth or Venus. Just the probabilities. The reason isn't because they need more data. It's because the car is on an orbit that will take it past Mars and Earth and the gravity of each planet can influence its trajectory. The first close pass by Earth will be in 2091, when it will go within a few hundred thousand kilometres. "It's a chaotic system, and any small perturbations would grow dramatically, so we can only really answer questions in a statistical sense." Will it look like a car? It's also uncertain whether the Roadster will look like a car or something found in a wrecking yard. There is intense cosmic radiation in space, which is not only dangerous to humans, but anything that's organic. The paint, seats, tires and carbon-fibre body will all be changed dramatically by the radiation. And the windshield is likely to take a beating from micrometeoroids, small rocky debris left over from the formation of the solar system. "After a few million years, it may not look like a car anymore," Rein said. Stronger components on which the car is attached, like the metal in the upper stage of the rocket, will last longer. So, if there are any human beings on Earth a million years from now, should they be worried? "I'm not an expert on what would happen when it hits the Earth's atmosphere, but given its size, it will most likely burn up completely, or some components might hit the Earth," Rein said. "There is no health and safety risk at all. You're more likely to get killed by a car if you stepped on the sidewalk than by this car."